Story published in the Vancouver Sun February 21, 2011. Local Twihards can start swooning again after Robert Pattinson and Kristen Stewart, the two stars of the blockbuster vampire series The Twilight Saga, flew in Monday afternoon to Vancouver International Airport. The two onscreen lovebirds — and rumoured real-life couple — were spotted in the international terminal, arriving to film the latest instalment of the Twilight series, Breaking Dawn. They flew in on a private jet and were escorted to customs. 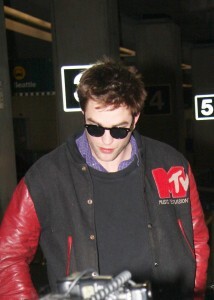 After some 30 minutes, Stewart, who plays Bella Swan, was first to leave the terminal. She was wearing sunglasses and looked casual in jeans. She ran out to her waiting vehicle, shielding her head from waiting paparazzi with a jacket. This was written by Amanda Ash. Posted on Monday, February 21, 2011, at 9:30 PM. Filed under Articles, Celebrity, Vancouver Sun. Tagged Breaking Dawn, Kristen Stewart, Robert Pattinson, Vancouver. Bookmark the permalink. Follow comments here with the RSS feed. Post a comment or leave a trackback.